The Best Higher Education blogs from thousands of top Higher Education blogs in our index using search and social metrics. Data will be refreshed once a week. 2.20 Jenzabar – Software & services for your unique institution of Higher Education. 2.28 ConnectED | Ellucian Blog | Let's talk higher ed. 2.78 Teaching & Learning in Higher Ed. Higher Education newsletter is a comprehensive summary of the day's most important blog posts and news articles from the best Higher Education websites on the web, and delivered to your email inbox each morning. To subscribe, simply provide us with your email address. Washington, D.C. About Blog Free Higher Education News, Jobs, Career Advice and Events for college and university faculty, adjuncts, graduate students, and administrators. Facebook fans 92,719. Twitter followers 200,748. Washington, DC About Blog Education’s partner in change, helping learners, educators, institutions & companies thrive in today’s complex world. Facebook fans 13,239. Twitter followers 37,681. About Blog The global window on higher education. Facebook fans 20,274. Twitter followers 17,341. Fairfax, VA About Blog Diverseeducation.com informs the higher education experience for all with news, career information, research, statistics, and resource tools from a diversity perspective. Facebook fans 37,502. Twitter followers 14,699. Facebook fans n/a. Twitter followers 30,080. New York City About Blog First published in 1987, World Education News & Reviews (WENR) is an authoritative news and information source for professionals in international education. Specializing in the evaluation of foreign academic credentials, WENR keeps readers abreast of education developments around the world and includes practical "how-to" articles on credential evaluation, international admissions and recruiting. Facebook fans 8,019. Twitter followers 5,907. London, UK About Blog The PIE News is a media, recruitment and consultancy platform for Professionals in International Education. Subscribe us to keep up with News and business analysis for Professionals in International Education. Facebook fans 8,665. Twitter followers 14,432. Philadelphia and Washington About Blog The mission of FIRE is to defend and sustain individual rights at America’s colleges and universities. These rights include freedom of speech, legal equality, due process, religious liberty, and sanctity of conscience—the essential qualities of individual liberty and dignity. Facebook fans 25,838. Twitter followers 23,327. Facebook fans 1,914. Twitter followers 2,611. About Blog View the latest in higher education news, covering finance, technology, careers and policy from the national to the local level. Facebook fans 3,491. Twitter followers 2,520. About Blog The Higher Education Academy enhances teaching quality in higher education institutions, and develops individual careers through teaching resources. Facebook fans n/a. Twitter followers 26,890. State College, Pennsylvania About Blog We here at HigherEdJobs appreciate the efforts it takes to be successful in your job search. We have compiled some original and/or exclusive articles below that we feel will be practical and inspirational during this process. As always, we appreciate the privilege of helping you achieve your goals. Facebook fans 8,882. Twitter followers 21,138. Austin, TX About Blog Talent management software for Higher Education, K-12, and Government. Make recruiting, hiring, developing, and retaining educators and staff easier. Facebook fans 734. Twitter followers 2,384. Madison, WI About Blog Faculty Focus publishes articles on effective teaching strategies for the college classroom, both face-to-face and online. Facebook fans 1,672. Twitter followers 9,068. Iowa City and Denver About Blog The blog of Ruffalo Noel Levitz, the leading enrollment management consulting firm. Facebook fans 1,639. Twitter followers 3,832. Kansas City About Blog Keypath Education provides marketing and online program management services to launch programs, grow enrollment and achieve sustainability. Facebook fans 1,842. Twitter followers 1,984. Knoxville, TN About Blog As the association for HR professionals in higher education, CUPA-HR provides leadership on higher education workplace issues in the U.S. and abroad. Facebook fans 1,884. Twitter followers 2,318. USA, UAE, South Africa, India About Blog Creatrix Campus provides a better way to education management with a fully customizable cloud ERP solution for schools and higher education to meet their strategic goals. Facebook fans 1,684. Twitter followers 358. Hoboken, NJ About Blog We are higher education's leading marketing information and technology services company dedicated to helping institutions find, enroll and retain students. Facebook fans 147. Twitter followers 531. 20. Jenzabar – Software & services for your unique institution of Higher Education. Boston, MA About Blog Jenzabar is a leading provider of enterprise software, strategies, and services developed exclusively for higher education. Their integrated, innovative solutions advance the goals of academic and administrative offices across the campus and throughout the student lifecycle. Facebook fans 1,145. Twitter followers 1,579. Great Barrington, MA About Blog This blog focuses on online learning, higher-ed technology, and challenges in the industry. It is co-published by Michael Feldstein and Phil Hill, who are also partners at MindWires, an educational technology analyst and consulting firm. Facebook fans n/a. Twitter followers 5,036. Boston | New York About Blog We help higher education institutions identify, recruit, and enroll students with admissions management and marketing automation software and services. Facebook fans 481. Twitter followers 631. Facebook fans 5,852. Twitter followers 16,653. About Blog News from Study in Denmark about Danish research and higher education. The website is run by the Danish Ministry of Higher Education and Science. Facebook fans 404,410. Twitter followers 1,639. UK About Blog Wonkhe is a blog about UK higher education policy. Follow us to keep up with the latest analysis, research, comments, debate, university jobs and recruitment news. Facebook fans n/a. Twitter followers 26,316. About Blog EDUCAUSE® is a non-profit association that helps higher education optimize the impact of IT. All EDUCAUSE activities and services aim to strengthen higher education. EDUCAUSE helps members understand and grow the strategic role of IT in higher education. Facebook fans n/a. Twitter followers 12,282. London About Blog Follow us to keep up with latest news and articles on Higher Education from The Guardian, world's leading liberal voice. Facebook fans 7,977,453. Twitter followers 7,248,711. 28. ConnectED | Ellucian Blog | Let's talk higher ed. Reston, VA About Blog Ellucian's technology solutions are designed for the modern student specifically to meet the needs of higher education. Our software and services help students, staff, and faculty achieve their goals. Facebook fans 4,405. Twitter followers 4,701. About Blog The Higher Ed Live network offers viewers direct access to the best and brightest minds in education and allows viewers to share knowledge and participate in discussions around the most important issues in the industry. Higher Ed Live provides live, weekly content about admissions, advancement, marketing, student affairs, and communications to higher education professionals. Facebook fans 2,868. Twitter followers 19,139. Washington, DC About Blog The major coordinating body for the nation’s colleges & universities, representing nearly 1,800 higher ed leaders. Facebook fans 367. Twitter followers 27,733. Facebook fans 1,069. Twitter followers 8,082. UK About Blog The Higher Education Policy Institute was established in 2002 to shape the higher education policy debate through evidence. We are UK-wide, independent and non-partisan devoted exclusively to higher education. Facebook fans n/a. Twitter followers 9,060. Australia About Blog Campus Review is Australia's leading independent tertiary education print and digital content provider. Our widely respected journalists engage an audience of more than 111,000 people every month, delivering over 50,000 leads a year in an industry worth about$84 billion per annum. We are widely read by VCs, academia, researchers, professors, technical staff, heads of faculties and support staff. Facebook fans 150. Twitter followers 4,756. San Diego, CA About Blog The Higher Ed Marketing Journal is an online marketing blog focused primarily on the marketing of Colleges and Universities. The authors featured are industry experts who are looking to help provide advice, tips, and insight into the of marketing of higher education. Facebook fans 356. Twitter followers 958. Facebook fans n/a. Twitter followers 5,155. Orange County, CA About Blog This blog is a place to dialog and share resources about effective teaching in higher education. Facebook fans 1,336. Twitter followers 2,137. Chicago, IL About Blog We've been thought leaders in higher education since 2001. Let us help you answer your questions about research, branding, website redesigns, digital marketing, or any other communication challenges facing your institution. Facebook fans n/a. Twitter followers 4,492. Cleveland, Ohio About Blog HighEdWebTech.com deals with the tech side of web development in higher education as well as marketing and communications. Boston, Dublin, London, Sydney About Blog A blog covering Higher Education digital marketing, content management, digital engagement, student recruitment and alumni engagement including examples from international Universities and colleges. Facebook fans 348. Twitter followers 2,112. Toronto, ON About Blog Daily commentary on all issues related to higher education. Facebook fans n/a. Twitter followers 1,793. Facebook fans 1,119. Twitter followers 1,359. About Blog The universe's most powerful enabling tool is not knowledge or understanding but imagination because it extends the reality of one's environment. Facebook fans 9,747. Twitter followers n/a. Chicago, IL About Blog Almost all cultures have a tradition of telling stories. I've long believed data can make stories richer and can provide more insight into the things we live out each day. And I think the stories I can tell that most need telling are about Higher Education in the United States. Facebook fans n/a. Twitter followers 2,022. Facebook fans n/a. Twitter followers 7,344. Dallas, TX About Blog My name is Michael Harris and I am an associate professor of higher education. I have spent over ten years teaching and researching higher education issues. This is my personal blog focused on demystifying higher education. I do this in two ways. First, I address current topics and issues facing colleges and universities. Second, I write about productivity and personal development. Ames, IA About Blog Social Media in Higher Education is a place where I’ll blog about the research I’m conducting and provide commentary on using technology in educationally-relevant ways. Facebook fans n/a. Twitter followers 11,292. About Blog Financial Higher Education for investors, students and academics. Facebook fans n/a. Twitter followers 21,559. Washington, DC—National About Blog Higher Ed, Not Debt is a multi-year campaign of dozens of organizations dedicated to tackling the crippling and ever-growing issue of student loan debt in America. With over $1.2 trillion in outstanding educational debt, affecting more than 40 million Americans, we have partnered around a simple message and a clear objective: Higher Ed, Not Debt! Facebook fans 7,076. Twitter followers 6,975. Facebook fans 500. Twitter followers 1,649. About Blog The Higher Education Whisperer: Vocational & University Course Design, Learning, Teaching & Research by Tom Worthington, Adjunct Senior Lecturer, ANU. About Blog Our Higher Education Legal Insights blog allows us to address issues facing institutions of higher education and share our group’s expertise and contributions with a broad community. We feature hot topics in education, including pending legislation, government investigations, developing litigation, case law, practical compliance tips, policy suggestions and event announcements. About Blog This blog is no longer devoted exclusively to discussion of class bias in higher education although it is pervasive. But then, again, it is pervasive everywhere in the US. I've run out of gas on that. Not only that, with the departure of a former dean, I lost much of my rile about my own law school. So I'm just winging it. Facebook fans n/a. Twitter followers 4,598. About Blog Daily updates of news, research and trends by UPCEA. Bristol, RI About Blog A candid conversation with Roger Williams University President Don Farish on the issues of cost, debt and jobs that have pushed higher education into crisis - and how, collectively, we can work toward meaningful change in service of the student, the academy and society at large. London About Blog This website is used for investigative work, much of which was picked up subsequently by mainstream and industry press. Much of its content has been devoted to student loans, the ‘RAB charge’ and private HE providers. Facebook fans n/a. Twitter followers 3,484. New York, Florida, Kansas About Blog Higher Education Law Report is a resource for university officials, administrators, and professionals on the today's legal trends impacting the New York region. Facebook fans 337. Twitter followers 956. Sydney About Blog We believe the future of education will be co-designed by its leaders and stakeholders to be creative, cross-disciplinary, collaborative, industry integrated, impact focused, built on lifetime of learning relationships and accessible to all. We are a higher education and research strategy consultancy co-creating this future with those Leaders. Fort Worth, Texas About Blog This blog is dedicated to teaching and research focused on issues impacting the millennial generation including: social media, health, travel, and higher education. As a millennial who works in higher education, Dr. Jennifer Edwards is a mom, professor, and social media enthusiast. Facebook fans 54. Twitter followers 4,888. Facebook fans 116. Twitter followers 9,299. About Blog Arabia Higher Education is a specialized media outlet that follows higher education trends in the Middle East. We publish news and analysis in major areas of higher education including accreditation, technology in education, learning, and assessment. Arabia Higher Education provides a window to the global education world so that to help researchers stay abreast of global education trends. Facebook fans 1,930. Twitter followers 153. London, UK About Blog The Society for Research into Higher Education is an independent and financially self-supporting international learned society, advancing the understanding of Higher Education through research and scholarship. Facebook fans n/a. Twitter followers 2,629. Liverpool About Blog This blog is written by students and staff of Go Higher, Liverpool University’s unique one-year, part-time access Diploma for people aged 20 without the traditional entry qualifications for degree-level study. The programme has a long history of helping hundreds of talented individuals in to higher education, many of them people who had assumed that university was beyond their reach. Washington, DC About Blog Celebrating geeks and nerds on campus since 2013. A blog about higher education and all things geeky. Facebook fans 142. Twitter followers 1,366. San Luis Obispo CA About Blog Steve shares insights into business ethics through his Workplace Ethics Advice blog and special take on ethics in colleges and universities in a new blog, Higher Ed Ethics Watch. Sharing my experiences and insights on ethics in academia. Facebook fans n/a. Twitter followers 1,588. Washington, DC About Blog Official Blog of American Educational Research Association, a national interdisciplinary research association for ~25K scholars who undertake #edresearch. Facebook fans 860. Twitter followers 22,769. Facebook fans n/a. Twitter followers 1,242. About Blog CASHNet offers colleges and universities one comprehensive platform to manage the campus payment experience. Dive into industry insights, technology trends, product updates, and best-practices. About Blog The Association for Talent Development (ATD, formerly ASTD) is the world’s largest association dedicated to those who develop talent in organizations. These professionals help others achieve their full potential by improving their knowledge, skills, and abilities. Facebook fans 23,308. Twitter followers 34,379. About Blog Surveying the Construction of Global Knowledge/Spaces for the 'Knowledge Economy'. The GlobalHigherEd weblog is edited by Kris Olds (Professor, University of Wisconsin-Madison) and Susan Robertson (Professor, University of Bristol). About Blog This is a Blog that shares every minute Information to students regarding MS in US and other Higher Education Aspects. You will find each and everything related to Higher Education from Abroad i.e. from GRE/TOEFL/IELTS to Application Process to Visa and even How to Book Flight Tickets. We will also try to cover and inform you about Higher Education in India. 78. Teaching & Learning in Higher Ed. About Blog Supporting teachers and reformers in higher education through encouraging serious engagement with the scholarship on teaching and learning. Facebook fans 1,187. Twitter followers 916. California About Blog Major changes occurring in the world are redefining the metrics of excellence for higher education. Authored by Lloyd Armstrong. London About Blog News and Opinion about Arab Higher Education. To serve as a forum where others can express strong opinions on topics relevant to higher education. 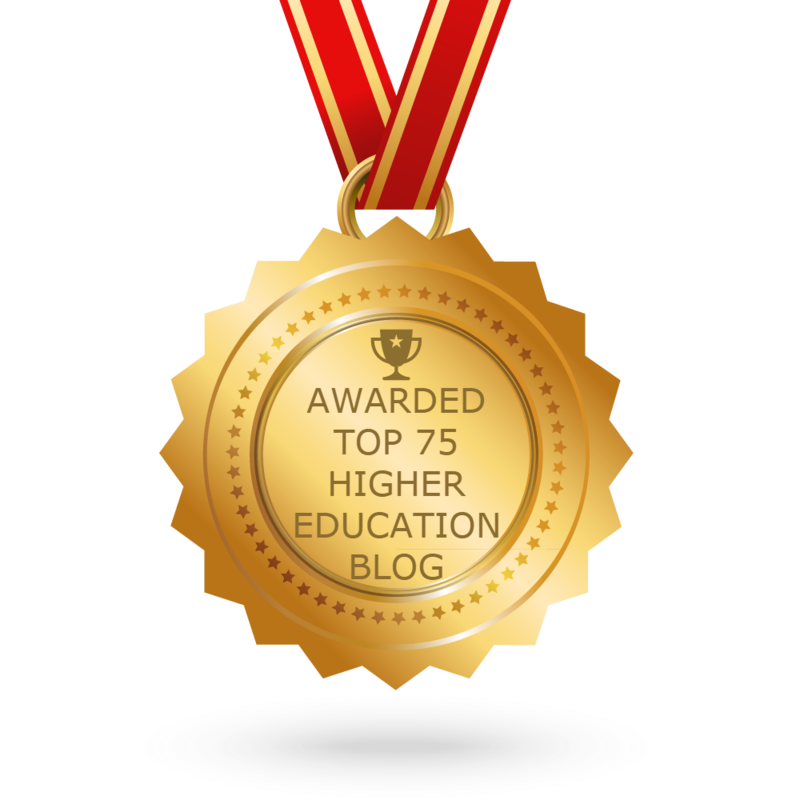 CONGRATULATIONS to every blogger that has made this Top Higher Education Blogs list! This is the most comprehensive list of best Higher Education blogs on the internet and I’m honoured to have you as part of this! I personally give you a high-five and want to thank you for your contribution to this world.